Party track Paisa Yeh Paisa, from the upcoming multi-starrer:- Total Dhamaal, is out now and has glamour written over all it. 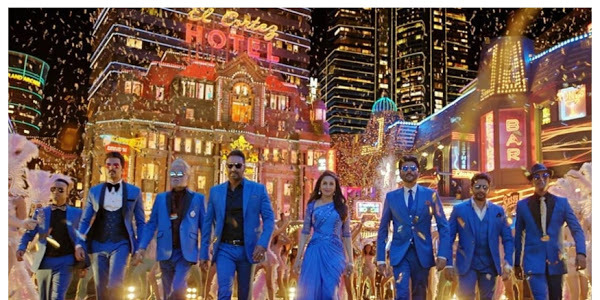 Featuring the huge star cast of the film including Anil Kapoor, Madhuri Dixit, Ajay Devgn, Riteish Deshmukh, Arshad Warsi, Sanjay Mishra and Javed Jaffrey in blue and gold costumes, the song is a fun dance number with catchy lyrics. However, it is Madhuri who steals the attention with her presence in the song. The actor makes a remarkable comeback as she steps out of a car in a red gown with a thigh-high slit. The Dhak Dhak girl keeps the spotlight to herself as she grooves to the peppy beats amid other male actors. Originally sung by Kishore Kumar with music by Laxmikant Pyarelal for Subhash Ghai’s 1980 film Karz, the song has been recreated for Total Dhamaal. Dev Negi, Subhro Ganguly and Arpita Chakraborty have sung the new version with music by Gourov-Roshin. The original Anand Bakshi lyrics have also been modified by Kunwar Juneja. Madhuri and Anil are coming together in a film after a gap of 19 years. They were last seen together in the 2000 film Pukar. The film also features Esha Gupta as the second female lead but the makers are yet to reveal more about her character in the film. The film also stars Boman Irani, Johnny Lever, Mahesh Manjrekar and Rajpal Yadav along with a star monkey, Crystal. The monkey makes its Bollywood debut with this film and has already featured in Hollywood films such as George of the Jungle, Night at the Museum: Secret of the Tomb and Hangover 2 and 3.